Nightmare Unknown #1, from indie publisher Broken Icon Comics, is the type of unique book that makes comics published outside the mainstream big two worth reading. Writer James Maddox crafts the story of a man who is immortal, in fact he may be the first man created, who every time he sleeps somehow advances humanity along the mental evolutionary chain. Seeing what the world has become recently, he's determined to not go to sleep again...but there are those who would beg to differ with him. A unique mash up of mystery, noir, and fantasy, Nightmare Unknown #1 "Crimes Against Humanity" is an engaging read that sets an interesting premise that in turn leads to mysterious undertakings that are tantalizingly hinted at but not fully defined. Just who is this undying man who sleeps mankind forward, and what is the "greatest crime in human history" that he claims to have committed? Is it his ability to advance the mental and societal development of mankind? We're not sure, and that's the hook that draws us in. 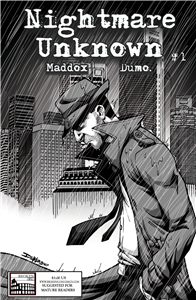 Artist Rob Dumo brings Maddox's story to brilliant black and white life. His artwork jumps effortlessly between time frames and eras, and his sense of action, as well as more pensive moments, is top notch. In short, his work is much better than one sees in many independent works. Nightmare Unknown will not go unknown for long if the storytelling and art keep up the excellent pace established in issue #1.